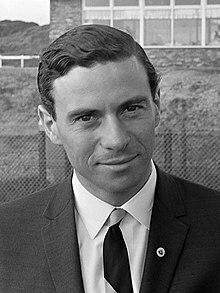 James Clark, Jr OBE (4 Mairch 1936 – 7 Aprile 1968), kent as Jim Clark, wis a Breetish Formula Ane racin driver frae Scotland, wha won twa Warld Championships, in 1963 an 1965. ↑ Up till 1990, nae aw pynts scored bi a driver contreibutit tae thair final Warld Championship tally (see leet o pynts scorin seestems for mair information). Nummers wioot parentheses are Championship pynts; nummers in parentheses are tot pynts scored. This page wis last eeditit on 20 Julie 2018, at 06:15.